Addameer Prisoner Support & Human Rights Association calls on campaigners, activists, and people of conscience to take actions for Palestinian Prisoners’ Day on April 17 to stand in solidarity with all Palestinian political prisoners. 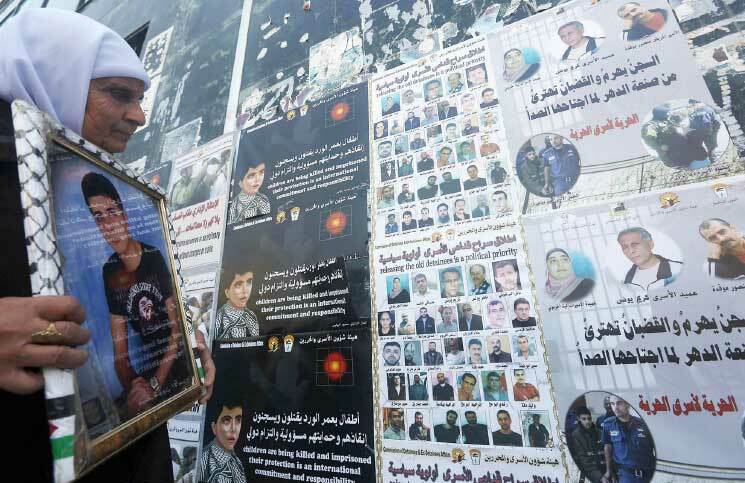 Every year, the month of April is considered Palestinian prisoners’ month. In this month, the Palestinian people and supporters of justice and liberation for Palestine all over the world mark this month by expressing their support to Palestinian political prisoners through organizing events and activities to stand in solidarity with Palestinian prisoners of freedom. This month is one of demonstrations, rallies, marches, events and actions to commemorate, support and build solidarity for the struggle of imprisoned Palestinians. 2017 marks the year of 50 years of military courts and military orders, controlling all aspects of Palestinian civil and political life. We urge all activists, campaigners, organizations and people of conscience to organize actions for Palestinian prisoners’ freedom throughout the month of April 2017. Approximately 6,500 Palestinians are currently held in Israeli prisons and detention centers, including approximately 300 children and nearly 550 held under administrative detention, a form of detention without charge or trial that Israel uses to hold Palestinians indefinitely on secret information. Each year the Israeli military arrests thousands of Palestinians in an attempt to suppress any resistance to its continued occupation and apartheid policies. Among these are hundreds of children, some as young as 12 years old. In too many cases Palestinian children are tortured, ill-treated, placed in solitary confinement and coerced into signing a confession in Hebrew, a language which most Palestinian children do not understand. Every year approximately 500-700 children are sentenced in Israeli courts. Night raids are the most common form of arrest, during which Israeli soldiers will ransack an individual’s house, destroying personal property and abusing physically abusing family members. The arrested person will then be handcuffed and blindfolded before being thrown into the back of an Israeli military jeep, face-down, where the beatings, insults, and humiliation will continue. Under Israeli military law, Palestinians can be interrogated for a period of 75 days and denied access to a lawyer for 60 days. Since 1967, approximately 75 Palestinian detainees have died as a result of torture while under Israeli interrogation. Addameer Prisoner Support & Human Rights Association urges all people to organize events throughout the month of April to stand in solidarity with the struggle of Palestinian political prisoners. 2017 marks 100 years of the Balfour declaration; 70 years of Palestinian Catastrophe (al-Nakba); 50 years of brutal military occupation. This is also the year to hold the Israeli occupation accountable for its actions and to demand the immediate release of all Palestinian political prisoners! 1. Join Addameer social media campaign aims at raising awareness: hold a sign saying #Free_Palestinian_Political_Prisoners, or #StopAD (administrative detention campaign), #NotATarget (Human Rights Defenders campaign), and share either a picture of you holding a sign or just the hashtag along with a picture of a prisoner or a detainee on social media (twitter and facebook) to raise awareness. 2. Join Addameer’s campaigns and their Call to Action: Addameer has two major campaigns: Stop Administrative Detention campaign and the Human Rights Defenders. You could use any of addameer’s materials prepared for these two campaigns or any other materials on Addameer’s website. 3. Organize a protest, demonstration, speaking event or banner drop in your city, community or campus calling for the immediate release of all Palestinian political prisoners and to show solidarity with the hunger striking prisoners and detainees. 4. Write to Israeli officials or to your local MPs to demand release for Palestinian political prisoners. Write a message and email or fax it to the officials below. 5. Join BDS Campaign: Organize an action at HP office in your city to highlight the role of corporations involved in – and profiting from – the political imprisonment of Palestinians by the Israeli occupation. 6. Send an email to info@addameer.ps or to our Facebook page to let us know about any actions you are planning.